My name is Dr. Stephen Stokes, and I operate a private clinic in Fort Myers, Florida that specializes in correcting the cause of the most common types of pain. I treat back and neck pain, sciatica, neuropathy, headaches, migraines and chronic pain syndromes like fibromyalgia. I have been successful in helping these conditions since 2001, without the use medications or injections. My approach is different and is focused on something called Angiogenesis, and with this treatment, I have been able to restore function, while ending the pain in most of my patients. WHY CAN'T WE JUST GET BETTER? Every day the human body suffers injuries, but most of the time we are not even aware there is a problem because the body uses its innate ability to heal. The system works, and it is better than any medicine, however when it fails we develop chronic pain and the inability to recover. This failure is a result of an imbalance in your autonomic nervous system, between the sympathetic and parasympathetic. Simply put, the sympathetic is your gas peddle, responsible for activity and getting things done whereas the parasympathetic is the brakes, responsible for resting and healing. When maintained in perfect balance you are healthy and will be able to recover from almost any injury, but when unbalanced, when the sympathetic are dominant you will not heal. When the sympathetic brach of the autonomic nervous system becomes overly active it is called sympatheticotonia. Sympatheticotonia: is a stimulated condition of the sympathetic nervous system marked by vascular spasm, heightened blood pressure, and the dominance of other sympathetic functions. APS offers high frequency digital x-ray and diagnostic ultrasound-Butterfly IQ, right at our clinic. 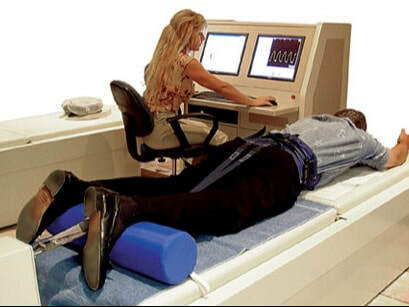 This unique combination of x-ray and ultrasound allows visualization of both joints and soft tissues, allowing a more complete picture of your problem. Getting a correct diagnosis and ruling out pathology that needs medical co-management is the first step in creating an effective treatment plan. We use Heart Rate Variability testing to directly evaluate the balance between the sympathetic and parasympathetic nervous system. One of the primary results of an unbalanced nervous system is sympatheticotonia and vascular spasm (ischemia). 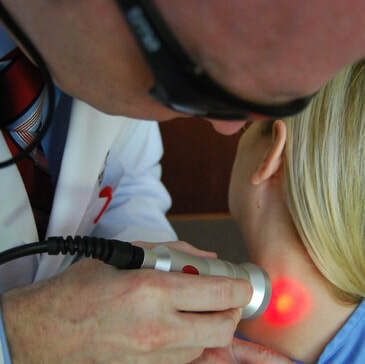 Balancing the autonomic nervous system and subsequently growing new blood vessels through our angiogenic treatment is the primary goal at Advanced Pain Solutions. We use a special program written by Patrick Botte of THRVE to get a live view of our patient's state of health. Everything we do clinically is designed to help reverse ischemia and assist the body in its natural healing process. We understand this mechanism and use advanced technologies to assist in improving the body to grow new blood vessels into the injured tissues. This is known as angiogenesis, and it reverses ischemia, allowing the injury to heal with a return of function. The key to growing blood vessels through angiogenesis is to promote the release of vascular endothelial growth factor (VEGF). Vascular Endothelial Growth Factor (VEGF):is a signal protein produced by cells that stimulates the formation of blood vessels. Using advanced therapeutics (LASER, PEMF, VAX-D, EST) combined with proper diet and supplementation we help stimulate the increased release of VEGF, thereby influencing the body's innate healing capabilities. Below we see a before and after MRI of a patient who was suffering from a severe lumbar disc protrusion of the L4 disc, and a severe degenerated disc at L5. Symptoms include sciatica leg pain, numbness in the feet, back pain with muscle spasms. After 6 weeks of therapeutic angiogenesis treatment we see a positive response with the patient reporting a greater than 90% decrease in symptoms. A local TV station did a documentary about our clinic and interviewed some of our patients. Hello! We are a small, privately run clinic in sunny southwest Florida, please keep this in consideration when you are calling us. We are providers for Medicare, and accept most automotive injury insurance and workers compensation policies. We also participate with Veterans choice. For those with private health insurance, we give you the proper paperwork, and you can file it yourself. You send it in, and whatever they pay, they pay. All new patients receive a no charge 20 minute consultation that will usually include a full examination. Office visits are 30 minutes long and cost $75, but some patients will require one hour visits that are usually $120. We have an onsite, digital, high frequency x-ray machine and charge $40 per series (2 films). These x-rays are not covered by Medicare. Standard office visits are 30 minutes long and a typical treatment program is daily Monday through Friday for 4 weeks or 20 treatments. Some people will need more some less, and some patients who live far away will do 3 times a week but for an hour per session. There is rarely one size fits all when it comes to treatment plans however we expect to see improvement within the first 2 weeks (10 visits) or usually we will not continue that treatment. What is dr. stokes educational background? Dr. Stephen Stokes and his wife Katherine. Dr. Stokes educational background includes an honors degree in Human Biology through St. Louis University (BS), he holds EMT/ Paramedic Training through Percom, A Doctor of Chiropractic Degree from Logan College (DC) and a Fellowship in Acupuncture from the International Academy of Medical Acupuncture (FIAMA). Dr. Stokes has acquired multiple continuing education credits at both Harvard Medical School (2014) and Stanford University (2015). Nationally board certified since 2001, Dr. Stokes specializes in the treatment of back and neck pain without the use of surgery or medications. His busy clinic sees patients from all over the country. Dr. Stokes is trained and certified under the former Minister of Health for Ontario, Canada, Dr. Allan Dyer, MD the creator of Vax-D and is currently one of the most experienced Vax-D providers in the United States. Dr. Stokes is the developer of Angiogenics™ and the Neurological Calibration Technique™ which he teaches to other physicians. As past president of the Lee County Chiropractors Association (FCA) he is actively involved in expanding the rights and scope of practice for chiropractors. A highly skilled manual therapist, Dr. Stokes routinely treated over 100 patients per day in his Michigan clinic before moving to Fort Myers, Florida with his wife Katherine in 2003. Today he prefers smaller patient loads, emphasizing individualized care for difficult cases. ​Dr.Stokes is the author of 2 books, Heal Yourself: The 7 Steps To Innate Healing and The Philosophical Physician, available on Amazon, and from this website. do you use stem cells? We use advanced therapies that stimulate your body's stem cells to differentiate but we do not use stem cells nor do we recommend stem cell therapy as per umbilical cord stem cell injection. It is our belief that this method of stem cell administration is highly flawed, and potentially dangerous. If we feel someone could benefit from stem cell therapy we always recommend Regenex and Dr. Chris Centeno, MD. is this treatment supported by research? Yes all the therapies we use are supported by lots of research which is available on the treatments page of this website. 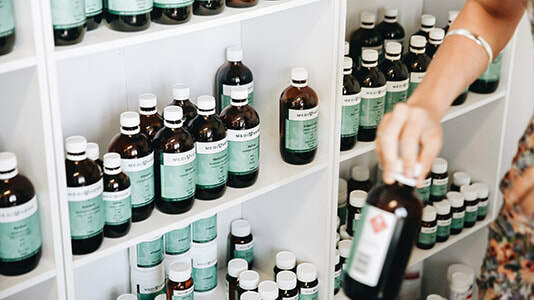 It is important to understand that our treatment are safe and backed up with many studies however many of the explanations surrounding treatments are theoretical and the truth is that no one really knows how a lot of this stuff works, just that it seems to produce results. Personally I am not a researcher but a clinician, which means that I gather my data like you, from the internet and by reading medical journals. Information is always changing, and therefore treatment is dynamic and not a static process. As a clinician it is my job to produce results, and help the patient heal not to validate the treatments beyond the FDA's approval that it is safe. I can show you th results, and I can provide some of the mainstream studies for you to consider but ultimately I do not engage in debates concerning what I do. I will provided you with the information, but I will not try and convince you one way or the other. I just want to buy some supplements. We only provide medical advice and products to our patients. If you are not in the Fort Myers area you may consider becoming a long distance patient. You can learn more about this by clicking (HERE). I am looking to ask dr. stokes a question, get a second opinion or speak with him on the phone. We only provide medical advice and products to our patients. If you are not in the Fort Myers area you may consider becoming a long distance patient. You can learn more about this by clicking (HERE). It is both unethical (and also unfair) to expect Dr. Stokes to to take calls and give advice to people he has never examined. We recommend you buy his book, Heal Yourself as a good starting place to understanding what Dr. Stokes recommends to his patients, you can purchase his book by clicking (HERE). It is the goal of everything we do to help influence angiogenesis and assist the body's natural healing mechanism. All our therapies have a proven record of clinical success and can be studied in detail by clicking on the links below. These treatments are usually combined with diet and nutritional supplementation and in very ill patients a 10 or 28 Day Cellular Detox. DIOWAVE HIGH POWERED LASER assists in cellular regeneration including nerve, muscle and cartilage repair. Laser is supported in the treatment of many conditions and is also safe for patients who have pacemakers (unlike electrical therapies). Because our laser is so high powered, it is possible to reach deep tissues like spinal discs, nerve bundles and even brain tissues. ELECTRIC CELL SIGNALING (EST) uses specific electrical frequencies (4,000-20,000 Hz) to eliminate cAMP from the injured site. This produces an effective nerve block that is compatible to an injection but without the use of drugs. 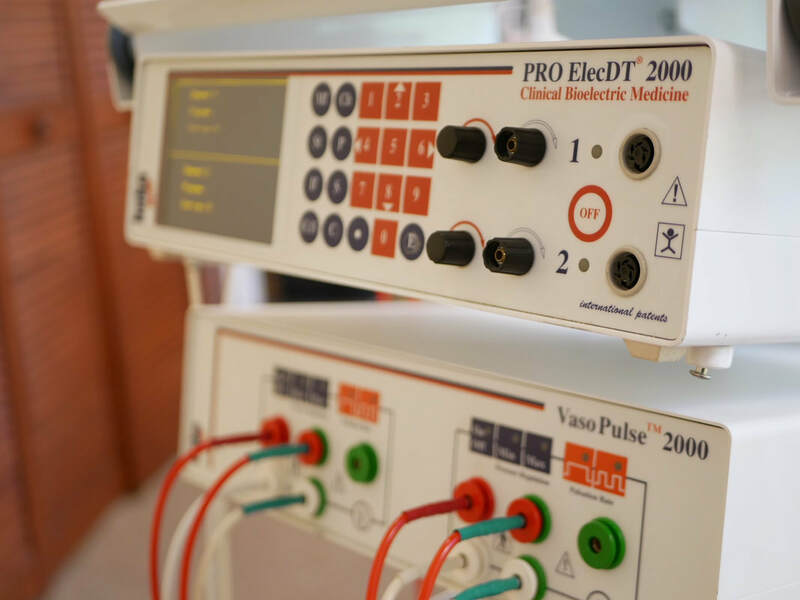 Unlike a TENs unit the EST can retrain the nervous system allowing it to heal. Treatments are cumulative and benefits increase over time. EST is essential in treating any neurological condition. PULSED ELECTROMAGNETIC FIELD (PEMF) is the new treatment that is changing everything we thought was possible in helping the body heal. FDA approved in the United States for bone tissue regeneration, we have over 500 published studies that support it's use in a wide range of pathologies ranging from Alzheimer's disease to even cancer. Changes are long lasting with immediate relief in most cases. 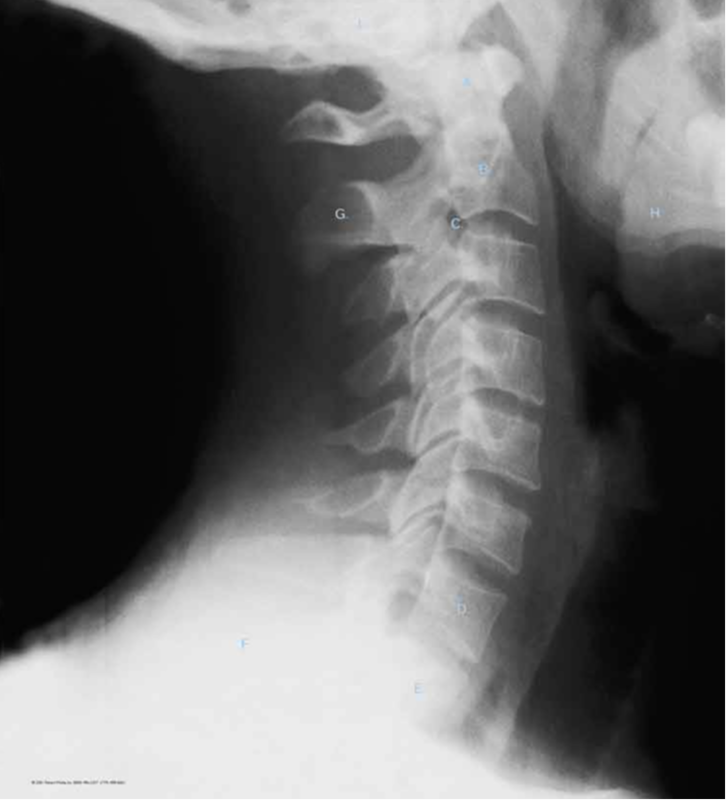 VERTEBRAL AXIAL DECOMPRESSION (VAX-D) was invented by Dr. Alan Dyer, MD the former assistant deputy minister of Health for Ontario Canada and developer of the heart defibrillator, Vaxd-D (Vertebral Axial Decompression) can reverse the cause of most back or neck pain in less than 30 days. We are SW Florida's most experienced Vax-D providers. Dr. Stokes mentored and trained personally with Dr. Dyer. DISC DISEASE SOLUTIONS ORTHOTICS are unlike any other device back brace on the market. In addition to offering support these braces remove pain pressure on the joint cartilage, helping it heal. This decompression influences angiogenesis and produce structural changes on both MRI's and x-rays in as little as 4 weeks. NUTRITION AND DIET provides a strong foundation for healing. At our clinic proper nutrition is responsible for at least 30% of the results we see. We exclusively use whole food concentrates from Standard Process and medical grade herbal extracts from MediHerb. These products are available at the clinic for ongoing patient support. PHYSICAL THERAPY is a broad scope of treatments that can include Exercise, Stretching, Chiropractic, Acupuncture Principles, Massage and Neuromuscular Rehabilitation. Many of these procedures, especially those involving fascial manipulation have shown good results in decreasing pain and helping the body heal quickly. There are many effective options to explore before surrendering to spinal surgery or pain management. Schedule a consultation (free for new patients) and lets explore the possibilities. My goal is helping people live incredible pin free lives with angiogenic treatment. I am dedicated to changing the perception of what is possible with new ideas and energy. Share my website with someone you know and contact me if I can be of further help, I am yours in service.